If you want to travel the world, it pays to be German. This comes courtesy of a new survey that ranks countries around the world on the amount of “travel freedom” accorded to their citizens. Travel freedom is defined as the number of countries where citizens can travel without needing a visa, or where they will receive a visa upon arrival. Germans have the most powerful passports in the world, offering visa-free access to 177 countries and territories out of a total of 218, according to the 2016 Visa Restrictions Index compiled by the London-based citizenship and immigration firm Henley & Partners . Germans have held this distinction since 2014. 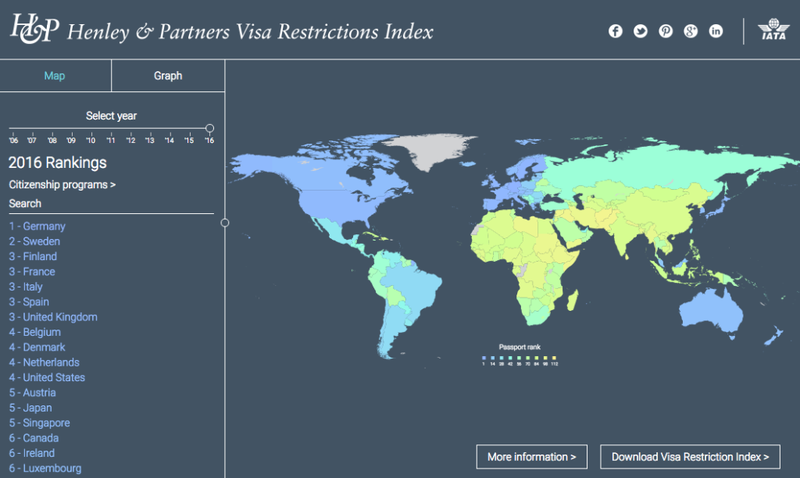 Swedes were close behind, with visa-free access to 176 countries. France, Finland, Italy, Spain and the United Kingdom all tied for third place, with access to 175 countries. United States citizens can drop in visa-free on 174 countries, along with citizens of Belgium, Denmark and the Netherlands. On the bottom of the list, with “ the worst passports in the world ,” are Somalia, Iraq, Pakistan and Afghanistan. A country’s ability to obtain visa waivers reflects its diplomatic relations with other countries. Visa requirements are also shaped by “reciprocal visa arrangements, security risks, and the risks of visa and immigration rules violations,” according to Henley & Partners’ press release . The report, published Feb. 24 and accompanied by an interactive graphic , notes a couple other big developments. Four countries made major strides in the rankings: Tonga, Palau, Colombia and the Southeast Asian nation of Timor-Leste. And Portugal, which began a “golden visa” initiative in 2012 that allows investors from outside the European Union to buy their way into residency, now has the world’s sixth-most powerful passports. Its citizens can travel to 172 countries without visas.